This morning I need to relocate my nuget packages folder 1 level higher to allow an offshore team to work parallel with us. Basically, the original solution was cloaked and branched. 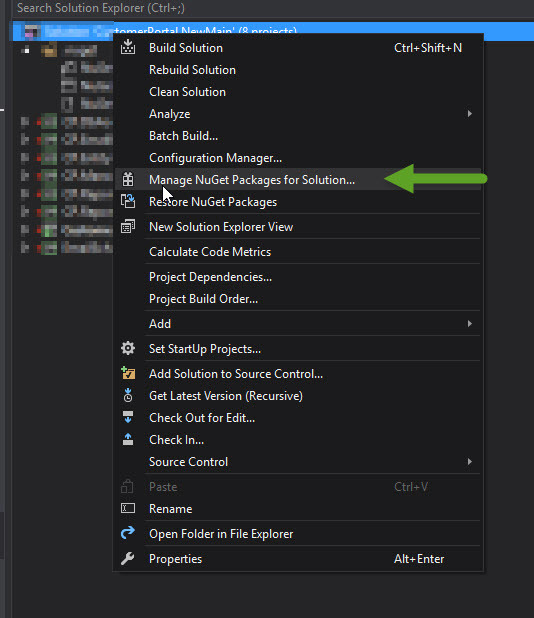 In the original solution we realised we had 2 places for nuget packages so hence we had to merge them into 1 solution. This mean’t that the branched solution need to match the original other wise we would have lots of reintegration issues. ../../packages/ – up another level. Then I needed to close the solution and reopen it for this change to take affect. I found this out as changing the file without restarting meant that nothing changed and my packages were still restoring to the old ../packages/ directory. This entry was posted in NuGet, visual studio 2015 by russellmccloy. Bookmark the permalink.